This post is no longer being updated, go here for current deals. 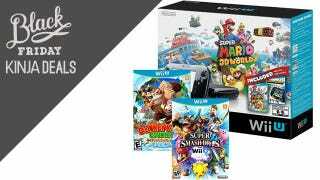 This 4-game Wii U Bundle for $360 has been one of our most requested Black Friday deals, and you can grab it now, on Wednesday, online, with free shipping. Promo code WIIUDEAL. There's no need to wait around for Black Friday deals; a lot of them have already gone live. Be sure to bookmark our Black Friday deals post, and keep checking back for the latest. While a lot of retailers offer basically the same stuff at basically the same prices on Black Friday, Best Buy had quite a few advertised deals that were head and shoulders above the pack, and you can get them right now. Of course, there are plenty of other Black Friday deals that are already live around the web, so be sure to check out our main Black Friday post for the latest, and follow us on Twitter for updates. During Black Friday week, one simply gets everything Middle-Earth for lowest ever prices. Amazon is bundling the Lord of the Rings Extended Editions set, one of the most popular Blu-rays we've ever listed, with Game of the Year contender Middle-Earth: Shadow of Mordor, and the books for just $72. The Blu-rays are at a new price low if you don't want the other stuff, and the bundle matches Black Friday pricing for the game. Both of the larger sizes of your favorite budget sound bar are at their lowest prices ever. The 54" and 42" sizes of the Vizio 5.1 Home Theater Sound Bar with Wireless Subwoofer and Surrounds were the runner up in our Best Sound Bar vote, behind the much more expensive Sonos PLAYBAR which we also have a deal on. The 54" model is down to $350 ($300 for Amazon Prime members), and the 42" model is down to $200 ($190 for Amazon Prime members). For those that want the convenience of a sound bar while sacrificing as little true surround as possible, or for anyone who just wants great sound on the cheap, the VIZIO 5.1 is a killer deal. The two satellite speakers connect to the wireless subwoofer, giving you left and right rear surround channels without running wires all the way around the room. Last year's Amazon Sonos event was one of our most popular Black Friday deals, and this year Amazon has expanded the selection to the entire line, including the new BOOST. You'll get a $20-$50 Amazon gift card with each component. SONO S is widely considered to be the best, and is without question the easiest wireless speaker system around, and their take on the sound bar, the Sonos PLAYBAR, was your choice for Best Sound Bar in our Kinja Co-Op series. You're reading this, so you're smart, so you probably already own a USB battery pack or two. Chances are though, you know of quite a few friends and family members whose phones die during the day because they aren't as well informed. If that's the case, any of these power packs would make a great gift this holiday season. Need a hefty new flash drive? These prices are all-time lows with the exception of the 32GB model, which is only $1 away. Black Friday week is a great time to buy a new hard drive. While new GoPro models have been released, the Hero3+ Silver has stuck around to fill the $300 price bracket of the lineup. Today, not only is Best Buy taking $50 off, they're also throwing in a 16GB memory card and an LCD BacPac for free.